These are familiar words that I have come to expect from all good managers at some point in their career. If you run your own catering or have contract caterers, I can guarantee that you will have questioned at some point whether you should outsource it or manage it yourself. The ‘cater, or not to cater’ argument is a question many venues inevitably bring to the boil. In my extensive experience in managing catering operations (both contract and self-managed), I have encountered the many pitfalls and advantages of both catering operations. As challenging as this is to answer, let’s take a look at this club industry conundrum. Firstly, let’s examine why we have a catering operation in the club environment and what exactly are the advantages? Club annual reports will show that, on average, very few clubs make a reasonable profit out of catering if at all, and that’s without taking into consideration the capital cost of kitchens, bistros, restaurants, function rooms and cafes. So if profit is not the principal motivation, what is? Clubs have aligned themselves to member expectations that meals are provided (traditionally low-cost), but the key motivation is that food is the only thing a club manufactures itself. Food gives venues the opportunity to create a real point of difference in a highly competitive environment and build a brand profile in the market. Many clubs provide inexpensive catering facilities to generate traffic in full understanding that they don’t make a significant contribution to profit. What this type of operation lacks on the bottom line, it does add to the ambiance and generates higher visitation, particularly on quiet days and lunch periods. Reputation management is key for delivering a consistent catering product as there are none judged harsher than food outlets. For many years the justification for providing inexpensive bistro operations was to attract patrons for cross-pollination into other facilities such as gaming, bars or TAB. However, due to the recent inclusion of catering into sophisticated loyalty programs, we can now identify how much alcohol is sold with food and its wider influence on the operations. The research indicates that food has a limited relationship to alcohol and even less with gaming, however there are some exceptions to this in the form of café style food offerings. Café dining is the only format that has reported solid impact on gaming operations, however this style of catering has the lowest adoption rate across venues. The use of functions and large auditorium rooms to provide catering is also something that many clubs pursue to increase their catering sales. Again, research from Queensland and New South Wales indicates that, whilst there is a slightly elevated level of alcohol sales to food than in other areas of the club catering operation, there is even less of a relationship between functions and gaming activity. The unfortunate reality is that most function facilities in the club environment will operate at a significant loss. One of the first issues you have to resolve is what style of catering do you want to provide your members and what price parameters to establish. Venues are starting to shy away from the ‘meat and three veg’ offering to more modern and sophisticated catering styles. 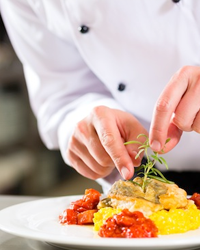 In order to identify the right chef for your venue, you need to develop a detailed job specification and contract of employment for specific terms and conditions. Due to a significant national shortage of skilled chefs, be prepared to pay more for a chef with a good track record in delivering your preferred style of catering. It is also important to review their employment history in previous positions. If it is erratic, this should raise significant concerns. Make sure you contact references personally, as well as contacting previous employers that may not necessarily be listed as contacts. This will help you gain a more accurate indication of the applicant’s character and skill set. Many clubs have overly extensive menus in an endeavour to please everybody. This substantially increases the carrying and turnover cost of food and significantly increases labour requirements. Instead, pick one style of cuisine and excel at its delivery. Pricing policies should be determined by the budgeted profit required of the catering operation. For most clubs, this will generally be more than they are charging if proper accounting standards are applied. Profit only comes from charging the right price and managing the cost of goods and labour. Catering operations can be assisted in managing its more complicated cost controls by ensuring that the financial controller has an involvement in stock takes, food ordering, and costed rosters. Where managers have little kitchen and catering management experience, the kitchen is a mystery room and is generally the least visited area. Ironically, it’s the main facility that commands a significant amount of the manager’s time and committee’s attention for a host of operational and quality issues. More often than not, the manager’s time will be disproportionate to its profit contribution. In addition to the operational and quality issues that in-house catering generates, there are other significant issues a venue must consider including industrial relations, staff turnover, service times, consistency, food hygiene and work health and safety, as well as the battle to make a profit or reduce losses. I indicated in the beginning of this article, I receive as many complaints from managers about the chef and their in-house catering operation as I do those about the contract caterer. In both cases, the common problem is caused by a lack of research into what style of catering clubs want to offer, and documented requirements of the performance, quality and service expectations from the chef or their contract caterer. Some clubs will argue that they lose flexibility with a catering contract, but that only occurs where the terms and conditions of the contract caterer have not been carefully developed. Poor catering operation performance of either type is quite often caused by a lack of knowledge of catering operations, as most managers will have developed a background in gaming or beverage management. Many catering issues can be resolved if managers spent more time reviewing catering operations against documented performance standards and consistent supervision of the department. In many instances where I been involved in analysing poor catering in club operations, it’s generally not the chef or the contract caterer that has created an issue, but the club itself in not clearly documenting the expectations and developing appropriate terms and conditions. I know many excellent club chefs and an equal number of quality contract caterers operating in the club environment. It’s ultimately the management of the club that determines the success or failure of whatever means of catering operation they use. DWS is currently managing the contract catering arrangements for a range of venues across Queensland, Victoria and New South Wales. We also specialise in the recruitment of head chefs as well as developing the careers of over 150 apprentice chefs in the Queensland club industry. To discuss your venue’s catering operations, contact John Dickson at john@dws.net.au or call (07) 3878 9355.